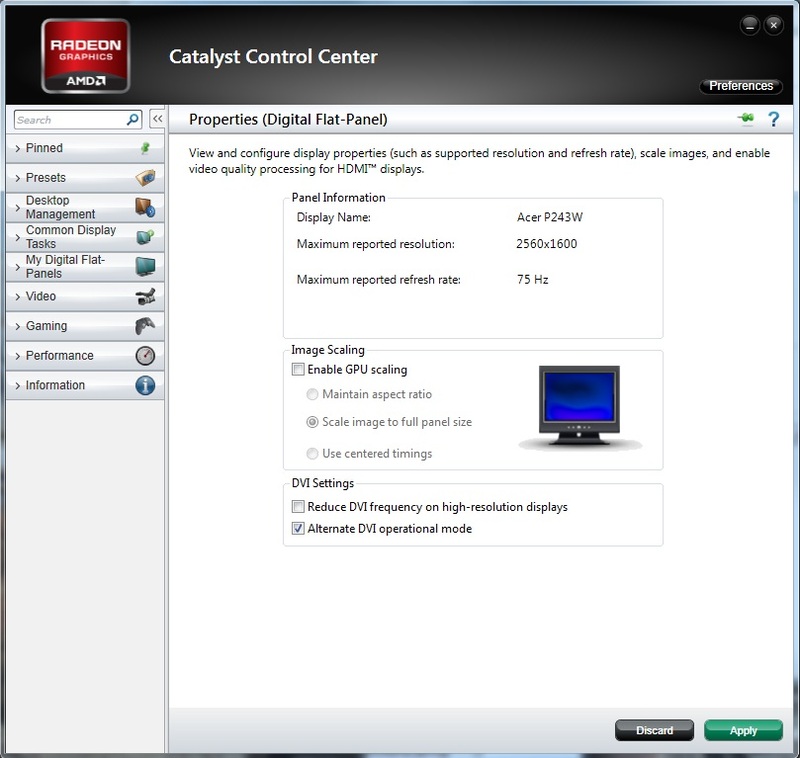 Discussion in 'Videocards - AMD Radeon Catalyst Drivers Section' started by BlackZero, Jul 25, 2012. Edit: It seems the utility is no longer functional with the latest catalyst 13.1 drivers. I will try to post an update when there's any news on a fix or a newer version. Edit 2: A temporary work-around can be found here. Keep in mind that the AMD Catalyst Un-install Utility currently supports Windows 7 only and should not be used with windows 8. Edit 3: Details concerning an alternative utility can be found here. Be sure to follow the instructions carefully and read the utility's requirements and limitations at the linked page. A regularly updated list of maximum resolutions possible according to display model. English language sources and originators of some material used in this guide. A similar guide for Nvidia users. This guide will demonstrate how to use downsampling with AMD graphics cards to attain a higher quality image in games and other applications without the need for high levels of antialiasing. This will be accomplished by using a java based utility called AMDDownsamplingGui. Usage of this utility is at your own risk. Download the AMDDownsamplingGui utility from any of the links above. Create a system restore point. Use the drop-down tab at the top to bring up a list of resolutions based on your display's aspect ratio. Click OK to install the chosen resolution. Alternatively, click Benutzerdefiniert to enter a custom resolution. Open display properties from the Catalyst Control Centre or screen resolution settings for your operating system to confirm the new display resolutions are now available. Ensure GPU scaling is not enabled. You may also need to ensure that the tick box hide modes that this monitor can not display is unticked from your monitor's advanced settings. Otherwise, you may get the following error message. If the tick box labelled hide modes that this monitor can not display is greyed out, you could try creating your own custom monitor driver by clicking INF erstellen from the Extras tab at the very top of the GUI. A selection of new maximum resolutions is already included and is based on display aspect ratio. Custom maximum resolutions can also be used by clicking Benutzerdefiniert, these should ideally also be chosen based on your display's aspect ratio. The new custom INF file can be saved to a location of choice by clicking Speichern. Instructions on how to install the custom monitor driver can be found by clicking Anleitung. However, the instructions are in German. Monitor driver installation instructions in English. Alternatively, you could try one of the custom monitor drivers posted at the original thread. All custom monitor drivers from above packed as a single download. To remove a custom resolution, choose the resolution from the drop-down list and click Löschen. 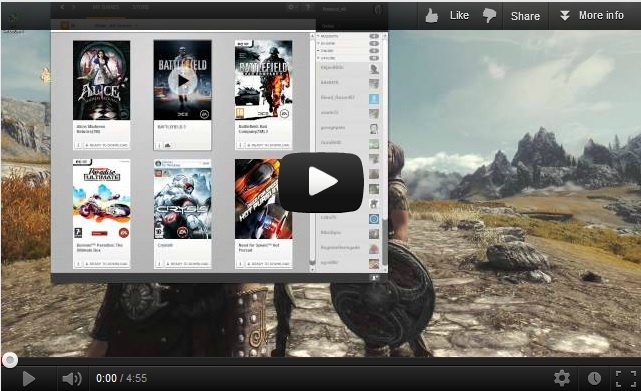 Watch the following video demonstration that includes in-game footage of Battlefield 3 with downsampling enabled. Click on the following thumbnails for a side-by-side comparison. To view at original resolution, right click and save to your desktop. I can't get the AMDDownsamplingGui utility to run. I can't get my display to work with anything higher than 2560x1440 or 2560x1600. For most display devices this may not be possible. A list containing display devices that can go higher with confirmed maximum resolutions can be found at the top of this page. Many thanks to WhiteLightning for spotting these. I can not change the tick box labelled hide modes that this monitor can not display, as it is greyed out in advanced display properties. You can try one of the custom monitor INF files posted in the guide. Many thanks to teleguy for spotting these. After changing the display resolution for my HDMI display most colours are darker or otherwise not correct. The display may have switched to RGB limited when using a custom resolution. Changing to non standard in the HDMI options should make the display run at full RGB. Many thanks to Derko1 for pointing this out. For some reason this utility is only allowing me to add the new resolution to secondary monitors and not my primary one. Any ideas? Apply it for each monitor by making the one you are using the primary and disabling the others, then apply the new settings from the single enabled display. This is what I had to do to get it to wok for my HDTV while my computer display was connected. There might be another way to do this by altering the display Index number at the top of the utility, I did not try this, however. Does the downsampling still work if I choose the custom resolution in windows and in-game? It should work fine whether you use the custom resolution for windows and games or only in games. Though, I would recommend using it just for games as the much higher resolution will probably make it difficult to navigate the desktop. Will using this utility result in increased CPU usage for heavily CPU bound games like Skyrim? Actually, running at a higher display resolution should either have very little effect on CPU usage or, more likely, reduce it slightly. Display resolution is not directly linked to CPU usage. Instead, a higher or lower display resolution increases or reduces GPU usage respectively. All other things being equal, a higher GPU load means less data required from the CPU and therefore lower CPU usage. In the specific case of Skyrim: the shadows, AI, water and other physics effects are CPU based, so the CPU is indeed quite important. However, running the game at a higher resolution will not affect the number of calculations for any of these, as the CPU based internal shadow resolution does not change and neither will the water or physics calculations increase with resolution. What will change, however, is that the GPU will be busier rendering everything at a higher resolution and will therefore refer to the CPU for data less often. How much performance will I lose when using downsampling? This will depend entirely on the game in question. In most cases the performance impact will be proportional to the increase in resolution or total number of pixels. However, graphics card memory may also need to be considered. Overall, this method should provide image quality comparable to full scene antialiasing but with far less compatibility issues and in many cases higher performance. The downside is that in some cases game menus may become harder to read. Fortunately, many games - for e.g. Arma 2 - allow you to increase the size of the UI and in some - for e.g. Need for Speed: The Run - it will auto-adjust. Here's a performance comparison for 'Dirt 2' posted by Derko1. I am using UltraVeryHigh settings for shadows, water, and reflections... maybe something else, don't remember this second. Basically they are extended beyond ultra settings that came with the game. Everything else is Ultra... with 4xSSAA. As you can see. I lost 23fps from average... which when comparing to how well it runs as it is, is minimal. I can't use the utility in windows 8 due to a missing digital signature error. A possible workaround was posted by nitroin. There is a way to have this tool working on Windows 8? I'm getting INF digital signature (I think WHQL) error. - Restore -> Advanced Options -> Reboot. The names can be a little different, I've done a literal translation from Italian. Been using the above(from a long time) for games which doesn't have AA option in-game or AA cannot be forced, it works wonderfully. Blackzero, does 3840x2400 work for you ? Works fine on my 42" 1080p HDTV for 2560x1440. Not sure why it doesn't work for your plasma TV and don't really have any experience with them so can't really help I'm afraid. I tried 3840x2400, but it didn't work for some reason and I ended up with a distorted screen. I am not too familiar with the other settings so didn't investigate any further. I have however used 3840x2400 in the past when using 'SSAA_Tool', but that doesn't work for every application or the desktop. So it probably could be made to work. I've also added further details regarding this matter from one of the other threads to the original post. I think there is more to it, you would need to alter the monitor driver, and then again there is no certainty that it would work since its different for each monitor. Upscaling, even its just a little is pure win. I don't have much insight on the working of the utility beyond the simplest features so can't really comment at all, and your German is probably a lot better than mine so you will likely make more sense of it. The monitor specific features are also interesting and do suggest the utility is working directly with the hardware so you most likely are correct. Also thanks for posting that list, will incorporate it into the OP. Perhaps you could pop in a post if there are any important updates. I am sure everyone taking an interest in this utility would appreciate that. Only that specific friendly GUI was released two months ago. Prior method was utilizing powerstrip. What's missing from your guide is that you have to install one of these custom monitor drivers. what did you set the resolution to ? and with what monitor ? the drivers are probably to set the monitor to lower Hz then they usually can. so 50hz instead of 59 , 60 or something like that. just to reach higher resolutions. These drivers change the maximum allowed resolution. If you're lucky your monitor already supports the desired resolution and you don't need these drivers. Might be that even though Windows detects the model, it's still using the "Generic PnP monitor" driver. Frequency etc. is still correct and running at 60Hz. Either way, all I recall needing to do was run that app, untick the "Hide the modes..." option and disabling GPU scaling. 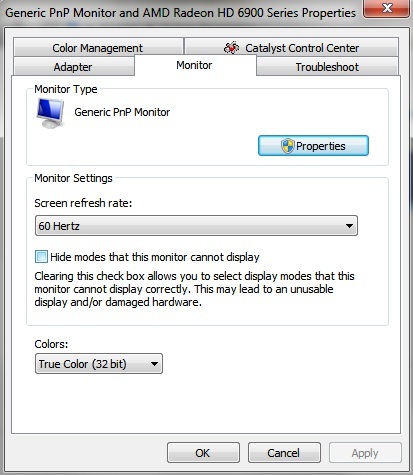 No, as suggested by Shaneus, I just simply unticked the option 'hide modes that this monitor can not display'. This worked for my standard display which has it's own driver and for my HDTV which uses the generic pnp driver. Though I suppose the above drivers may be of use to people who have the option greyed out. Would you be willing to try out the monitor drivers posted by teleguy? If these help with the 'greyed out' issue I could add them to the OP. My box for "hide modes this monitor cannot display" is greyed out as well so I get that error. I tried using Windows update to install a monitor driver which it did, and that changed nothing. I tried updating my driver and that did nothing either. Looks like I'll have to try installing that custom driver unless any of you have an idea why the box is greyed out. Well, great success, I tried the first custom monitor inf and it works. It sure looks terrible on the desktop though. Now time to try it out on some games. YES IT WORKED WITH THE DRIVER!!! Please add it to the guide then. I looked everywhere the last few months this was out to get it working and it never did. SO! I used the first one... it did not do anything for the grayed out box, but when applying the resolution, it simply works. I went to screen resolution from the desktop, then chose advanced settings, then monitor. Clicked on update driver, then chose the option to let me browse my computer for the driver. Then you must choose, Let me pick from a list of devices. Then choose "have disk" and point it to the file you just downloaded, after extracting ofcourse, and then rebooted and it's perfect! Seems it's working for most then. Glad to hear it. In that case I will add the drivers to the OP along with your explanation. Well! I did just encounter an issue. My monitor is 16:9 and I am only able to choose the resolution that you are using, it fills my screen fine, but I'm guessing it's squishing it in. ALSO! For some reason things are a bit darker in game, ie Skyrim, I worked on my own ENB for the game, but it's WAY DARKER than it was before the driver switch. I'll have to hunt that down. It seems like the color space has changed from full range, to limited... not sure though. Here's a program that lets you create your own custom inf files.